Inviting and cosy pub with friendly staff and decent food menu too. The rudest staff I have ever encountered. I ordered 2 single malt whiskeys 'with a splash of water'. These were presented to me with a 50% water 50% whiskey mix. When I tried to return them I was told they would not replace them as they 'did not want to waste' the whiskeys. I explained all I wanted was the two drinks I'd paid £7 for to be served properly and asked to speak to the manager. A middle-aged woman claiming to be the manager was even ruder than the other staff, and still refused to replace the drinks. When I asked for an e-mail address to complain to about their customer service I was told I could 'ask all I want' and that I was now barred from the pub. I wasn't given the details I required. Strange to treat a group of people having a quiet drink on a week night in such a haughty, dismissive attitude. Strange to 'bar' a customer for trying to complain when they have a legitimate gripe. Strange to cause all that fuss when all they needed to do was serve me two more whiskeys, served properly. If you don't fancy being treated appallingly for no reason, avoid this pub. Was in the Falcon on Friday with a friend. Busy, noisy - but then again it was a Friday night. We had bought 3 rounds of 2 drinks plus snacks and probably would have been there all evening. The second time I went to the bar my friend had changed what he was drinking so it was less than before - only about £7.50. The drinks were poured and placed on the bar in front of me. Different barman (I suspect the manager) said rudely "there;s a £10 minumum spend on cards" I said OK I'd have some crisps then. He said rudely we don't sell crisps. (I don't know if they do or not, but the certainly do snacks and stuff because we'd had some). I said well I don't have any cash. He said well you're not havign any drinks then. I turned round, left the bar, picked up my jacket and friend and left and drank soemwhere more pleasant for the rest of the evening, where they were happy to have my custom and were actually polite . Won't be back to the Falcon. Rude rude rude. The pub interior and the mix of ales is good here, but the low rating is due to a meal I had there on Jan 2nd. I was planning on eating elsewhere, but their apparently award-winning sausages tempted me to stay. I went for the honey mustard and chive ones (with mash), and was very much looking forward to them. However, they arrived very quickly, which aroused my suspicions, and I discovered the sausages were blatantly re-heated. They tasted of not much at all. On closer inspection and thought, I realised they appeared not to be the sausages I ordered - no mustard and not a glimpse of chive! They tasted like very ordinary bangers. Not just a disappointment but a total disgrace. I have been going to this pub for over 10 years but can no longer recommend it. We were not allowed to consume the drinks bought just before last orders, at 11.55pm - being thrown out at 12:07. We were just 2 people having a quiet drink. How this pub stays in business is beyond me with such an attitude. This probably explains when everyone leaves the pub an hour before closing time! A great pub located within spitting distance of one of Europe’s busiest railway stations. The Falcon has been sympathetically refurbished and decorated, and the outcome is an extremely well-constructed pub. Original floorboards have been stripped back and the stunning mahogany panelling and fireplaces have been restored to their previous splendour. Chandeliers and opulent lighting create a nice ambience and a central bar service area means you shouldn’t have to use your elbows when ordering. In actual fact, The Falcon has previously been in the Guinness Book of Records for having the longest bar counter in Europe. There is a constant trickle of people wandering in and out, some staying for a quick drink, others lingering over a bottle or eating in the dining area. The age group is varied, and due to the close proximity of the train station there are many people grabbing a quick drink before continuing their journey. Other customers are local residents, shoppers and workers. There is an area designated solely for dining and table service is available. You can also eat less formally in a more relaxed area of the pub. The trio of grilled fish: Scottish salmon, sea bass and cod loin with lemon and basil sauce, dauphinoise potatoes and seasonal greens is a definite favourite at £13.45. A good selection of steaks is also on offer, plus pub classics like gammon streak and eggs with chips. Sunday lunch is served and starts from £7.95. As a Nicholson’s pub, the choice of real ale on offer is very impressive. There are over a dozen ales available at any one time with tipples sourced from all over the UK. There is also a comprehensive list of wines on offer, which start from around a tenner a bottle, surprisingly affordable for central London. 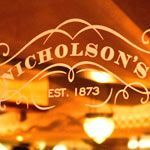 With its very respectable pub grub and award-winning ales in opulent surroundings, The Falcon is one of the best examples of the Nicholson’s group.